I didn't go to Quilt Market this year but I hope to go next year. It was great to be represented with making a quilt and other fun kitchen items to be shown at market. I've been reading the blog posts and was following Twitter blerbs about all that happened in Minneapolis. I have to admit I'm always a little jealous of those that go to market. They have so much fun. Sigh. And now Market is over and the cycle to anticipate the next Market begins. So I was really surprised when my great friend Flora brought me a piece of love from Quilt Market last weekend. Shocked really! 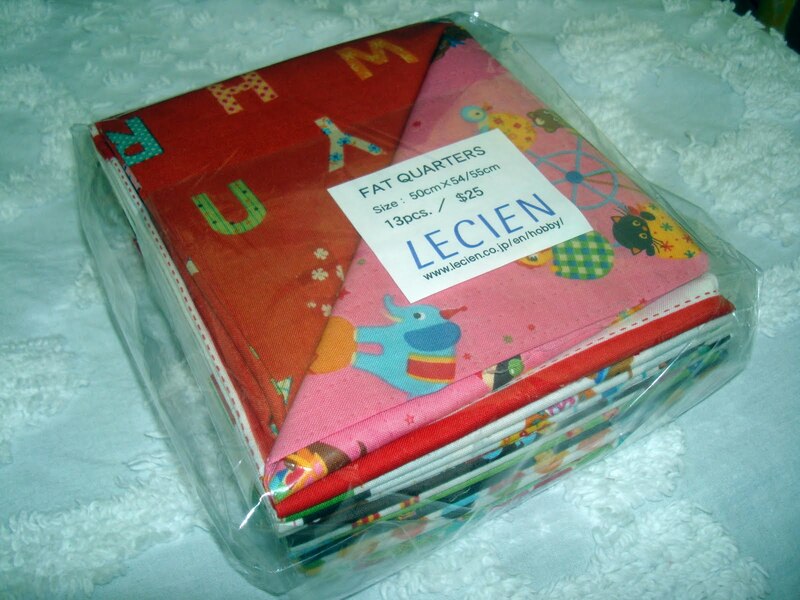 And it is Lecien fabric!!! My favorite stuff. The girls from Broadbent's Quilt Store had a great time at Market and brought some goodies back to Utah with them. And Flora shared with me. I'm so lucky. Thank you thank you. 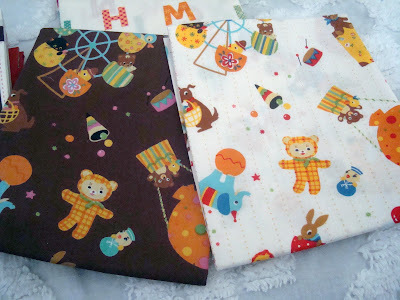 Having this fun fabric bundle sure heals that little bit of jealousy. The fabric is so incredibly darling. It is Lecien's Caramel Town line. It is just super cute. Aren't the characters absolutely delightful? I can't wait to make something with this. Something for Allison for sure. This panel comes in several color ways. That little gingham bear and the matryoshka toys are so so cute. I want to design a baby quilt around this line. Thinking, thinking thinking. The letters and circles are a very sweet compliment to the fabric. Darling stuff, all of it. I almost hate to cut into it. This is going to stay on my table for a bit so i can start imagining what I want to make. Gorgeous fabrics! 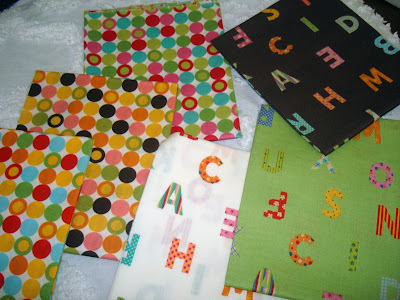 Oh, I agree, Nanette - some people have Coffee Table books, why not Coffee Table Fabrics! OMG, I love that fabric! I love your fabric fridays, it's always interesting to see new lines or old pieces that I otherwise wouldn't get to. 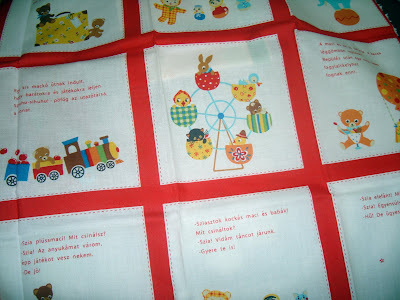 I love this one - polka dots and gingham bears - so cute! Nanette...love your market fabrics...wonderful...can't wait to see what you come up with! 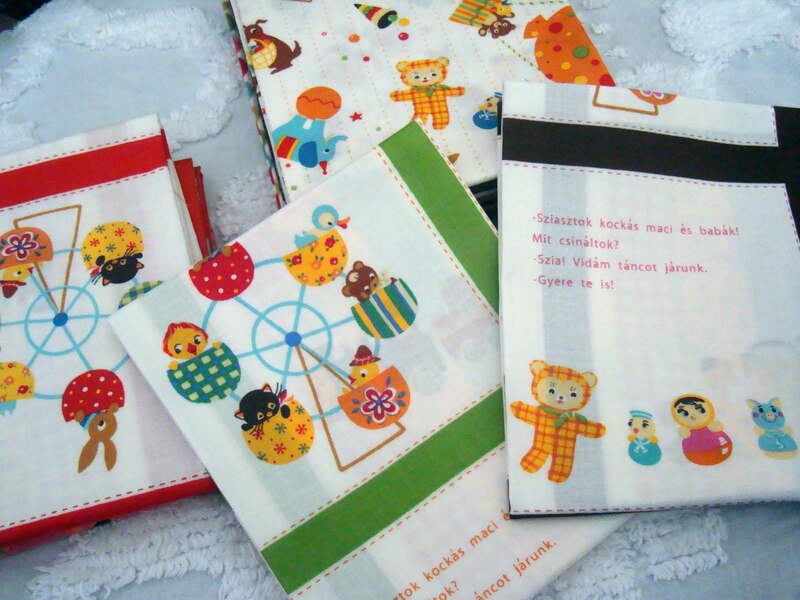 Lovely fabrics!Perfect for all projects! How sweet of your friend, to to bring you some love from the market. I guess she really knows you! Very cute fabric! Myself, I am eager to get to the International Quilt Festival next month. I have been saving my pennies and want to get ahold of some Lecien too, but of Monica's (Happy Zombie) new Christmas line with the Santa Gnomes. I sincerely thank the organizers of this Festival for coming to CA!! Have a good time playing with that yummy fabric, Nanette. Oh how cute! I don't even remember seeing that fabric -- I think I was blinded by flower sugar LOL! congratulations Nanette. I know you will design something lovely with it. 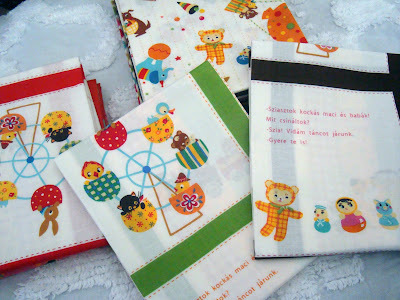 The fabrics are just so lovely! Have fun using them! Oh, Nanette, that fabric looks perfectly YOU! Can't wait to see the new Allison quilt. 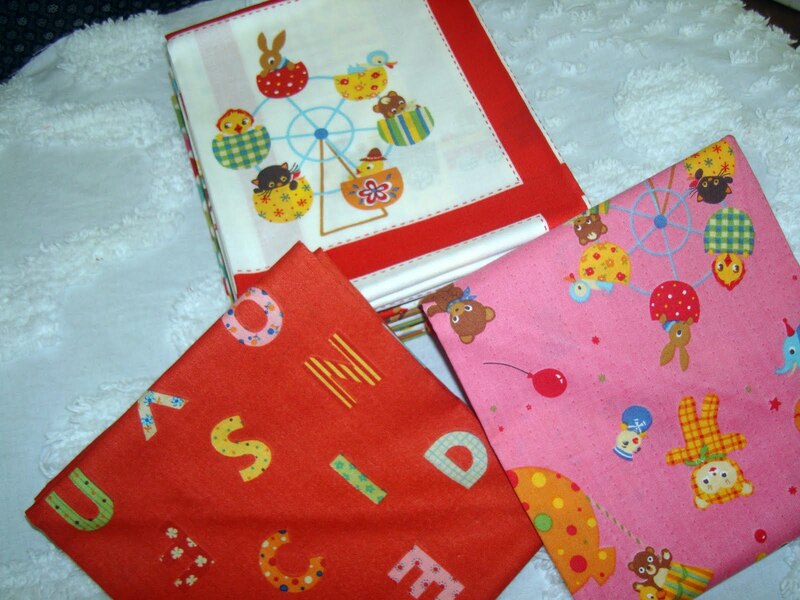 Very cute fabrics! I'm sure you will come up with something wonderful to do with them. How nice of her to bring you back some of your fav fabs. Can't wait to see what you do with them! So cute! I love the green background with alphabet one, simply adorable! Oh,that was so nice, what a sweet line. I see something cute for Allison! That Flora is such a sweetie. How nice that she brought back some fabric for you, which by the way is SO YOU! I can see you doing some really creative things, and know you will probably fussy cut something wonderful. Oh that fabric is so you, Nanette! Can't wait to see what you make for Allison! I love your new banner, too - you've been a busy gal since my last visit here! Fabulous fabrics Nanette: I wish we had such as this in Canada. You sure have been busy though! Ooooo that is so very cute! I love those letter prints. If you ever do go to Market we should have a little meet and greet! OH my, that Lecien fabric is to die for, as always. Lucky girl! I can't think of anyone who would give it a better home. Yes Yes Nanette...this fabric must be savored...looked at...touched and much thought put into it...what eye candy...yes, I think fabric can heal all kinds of wounds...especially market envy...what a sweet gesture from Flora! !